Click on the outlined areas on the map to zoom in and locate the mountains. The map areas are those depicted in Wainwright's Pictorial Guides rather than Birkett's Complete Lakeland Fells,. 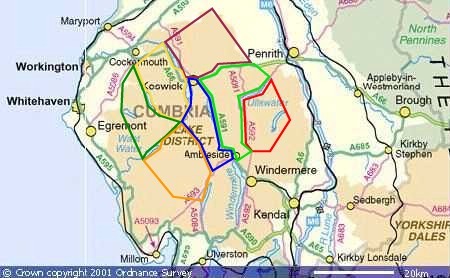 The Birketts are all the Lake District hills over 1,000ft as listed in Bill Birkett's Complete Lakeland Fells. (Birketts appear as Class=B on this website). Bill would be very interested to receive feedback/info from Birkett Baggers, and to hear news of any completers. You can contact him via his website (click the book image below). The Birketts list includes Pillar Rock which cannot be ascended without rock climbing equipment - click on the link for details of a route of ascent. Thanks to Bill Birkett - I highly recommend his website, and book the Complete Lakeland Fells, published by Harper Collins Willow. The list of Birketts are reproduced from this book by his kind permission.